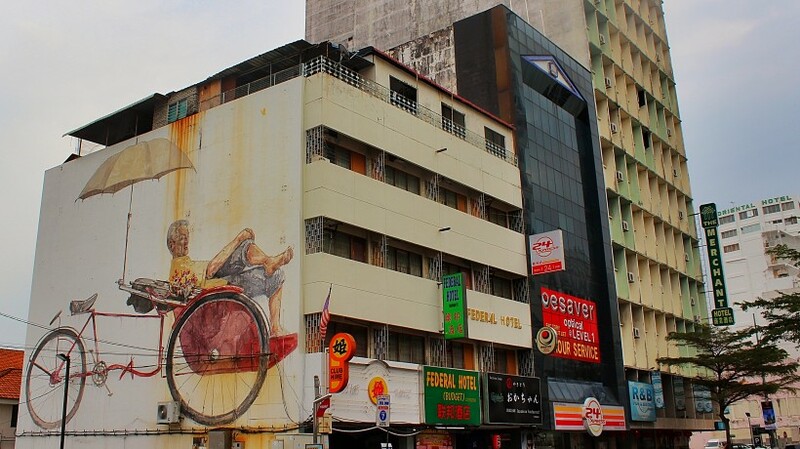 Mind-blowing street art in Penang, Malaysia. February 2014. If you’re interested in street art you’ve heard of Georgetown, Penang. Or you have, like I had, seen hundreds of photos of creative outside art on Instagram and other social media, mostly by the amazing artist Ernest Zacharevic. Because of that, I had a feeling of “seen it already”, so I came to the small island of Penang with the idea to just stay two days, but after just a couple of hours I had fallen in love with the town and the art and I ended up staying for as long as my trip would allow it. I came to Penang by night train from KL, I recommend it! You leave KL Sentral around midnight and arrive at Butterworth just before 6 am, and you get to sleep all the way there in a comfy bed on the train. The train ticket was about 15 US dollars, cheeper tickets are available if you don’t feel the need for a train-bed. When you get to Butterworth, just follow the signs to the ferry that takes you over to the island of Penang, for just 50 cents, or 1.20 Malaysian Ringgit. You will need cash (Ringgit) here, specially if you come by train from Thailand, there’s no currency exchange by the ferry. From the ferry on the Penang side I of course walked to the guesthouse I had pre-booked. Check out booking.com for a lot of hostels, hotels etc. I had the app on my phone and it was great because I pretty much booked the day of my arrival, I don’t like being to attached to prepaid reservations, it leaves some room for spontaneity! A common sight in Penang, the bike taxi-drivers resting on their cabs! 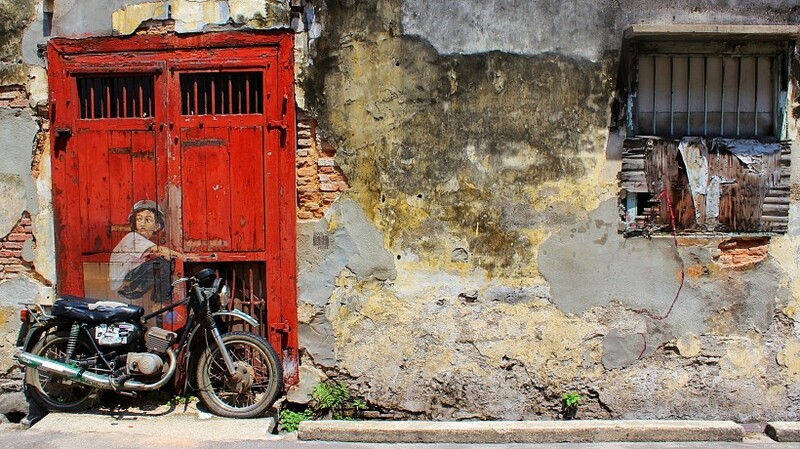 Georgetown is the old, historical part of Penang. Its colonial architecture mixed with different religious temples, the China Town of Penang and the occasional new building gives this small city its amazing charm. It’s easy to get around if you want to go from one side of the island to the other, buses are cheap and reliable. The island of Penang is not big, on the mainland side you have the town, including Georgetown and the rest of the island are beaches and resorts. To get around in town is cheap, use your feet! Bike or walk, most hostels and hotels have bikes for rent, the different bus lines can also take you from one end of town to the next, you pay in cash to the driver. The area around Armenian Street is worth doing on foot, sneak in to al the small passages, rest for an ice coffee in any of the many cute cafés and eat dinner from the street food venders in the afternoon!